We are pleased to announce some exciting news; we have a new name and logo! 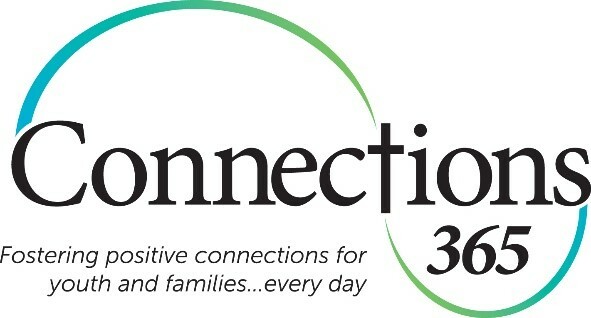 Our new name, Connections365, still represents all that is wonderful about CCPC. It also demonstrates our growth over the past few years. In addition to providing treatment foster homes and mentoring services, we also provide mental health services, residential services, a new satellite counseling office on Commercial street, and the ongoing pursuit of additional opportunities to assist youth and families in our community. Connecting youth to supportive foster families. Connecting people to counseling services. Connecting young people with mentors & resources. Connecting young men with residential treatment options. Connecting youth and families with the additional community resources they need. We are committed to serving youth and families throughout Oregon 365 days a year. Our dedicated board, staff, mentors, counselors, foster families and volunteers provide excellent support to all who need help. Thursday, March 29, 2018, at 11:30 a.m.
You will begin to see the new logo on documents, emails, websites and social media over the next few weeks. It is important to us that you know we remain committed to offering the same services you expect from us. We will continue our mission as a non-profit youth and family services agency. We appreciate your support for Connections365 and look forward to continuing our strong relationship. We could not continue to impact youth lives without you, our partners.